GSO's hybrid 0.965"-1.25" 90-degree mirror diagonal features Al+SiO2 coatings with 92% reflectivity across the visible spectrum and a 1/10 wave mirror. The main mirror housing is made of precision molded ABS plastic and the two end barrels are precision machined from aluminum. Weight: 3.5oz; 2 end caps included. Made in Taiwan. 4.9 (Based on 8 Reviews) 100% of reviewers recommended this product. This is the perfect way to make use of my telescopes with .965 visual backs with my collection of 1.25” eyepieces. No vignetting that I can detect and excellent image quality. This particular star diagonal is very good. Review by Tim of South Jersey. I added this diagonal to an old Meade 60AZ sold by Natural Wonders. The piece was better than the stock diagonal, sturdier, better materials. The transition to the 1.25" eyepiece rendered no negative effects that I can see. If there is a slight bit of vignetting, it is negligible and I do not notice it. I bought it to work with the Revolution Imager and it fits fine. It is heavier than the old piece as I would expect from metal and thick plastic components compared to thin plastic. Very satisfied. Review by DennyT of Ventura, CA. 5.0 Excellent Performance for the Price! As the description suggested, I bought this diagonal for a telescope I found at a garage sale (1980s Meade 60mm f/15 #291 w/mount+finder; MIJ). I also needed a star diagonal for a scope that had a 1.25" barrel, so this was the perfect choice for both. I am impressed with the build quality of this diagonal, I especially love the look and feel of the machined barrels. The endcaps are a nice touch. I had a tough time deciding between this diagonal, the erect prism version, or the dielectric version. I went with this one because I felt the specs were good enough for me and I didn't need an erect image. I am very happy with the views this diagonal provides in both .965" and 1.25" scopes. It gives a pure, true image. I don't have any vignetting on 1.25" scopes with standard plossl/MA EPs ranging from 4mm-26mm. I would love the option to purchase a standard 1.25" barrel just in case, though! All in all, this is an excellent product for the price. I would imagine the gains you'd get by spending a lot more would be marginal. Review by Ralphiebaby of Moscow, ID. I use this in an old C-90 SCT, it works but the set screw just hits the end of the barrel. I wish the 0.965" barrel were longer. Review by John7 of Oshawa, Ontario Canada. 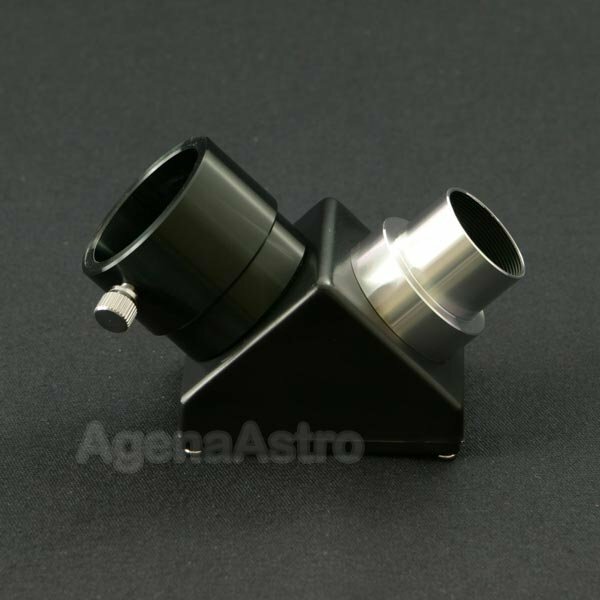 5.0 Renews old 0.965 Telescope to 1 1/4"
Up grades to 1 1/4 inch eye pieces, Big is better.